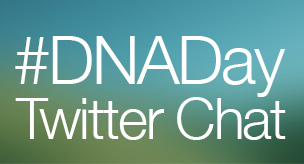 This Friday, April 25th, we are celebrating DNA Day, and to kick off the festivities, we are hosting our first Twitter Chat from the Center for Individualized Medicine. Join us as at 12:00pm (Central Standard Time) as we discuss the work that has come about since the Human Genome Project, and how Health Care has changed because of it. We'll also talk about the challenges faced by those working in Individualized Medicine, and where research is taking us for making medicine more personalized. If this is your first Twitter Chat, we recommend using TweetChat to participate and follow along with the conversation. Below you'll find our questions for the chat, and topics covered. How has the Human Genome Project affected Health Care in the last decade? What has Genomics brought to clinical application for patients? Can you know too much about yourself with Individualized Medicine? What are the challenges faced today with decoding Genomes? Do we have enough DNA samples to make informed decisions in Genomics? What is one thing you wish your Genome would tell you? What would you like your provider/doctor to know from your Genome? How does Individualized Medicine help patients with “mystery” diagnosis’? What have we learned from the Genomes of diseases? What does the future look like for Genomics? What are some of the current obstacles for Health Care and Genomics?